In 2008, America suffered a massive economic heart attack. Its doctors, thought to be the world’s best, believed the US to be in good health, having recovered from a similar though smaller crisis in 2000. But America hadn’t recovered. In fact, the Fed’s palliative for the 2000 crisis, i.e. lower interest rates, soon created an even larger crisis, i.e. the 2002-2006 US housing bubble whose collapse caused global credit markets to contract and investment banks to fall, necessitating government intervention on such a massive scale it led to today’s sovereign debt crisis as private losses were absorbed onto public balance sheets; and, now, in 2010, the crisis continues to fester and spread. Fed Chairman Ben Bernanke’s solution for our current problems is but a more extreme version of the Fed’s near fatal prescription in 2001, i.e. 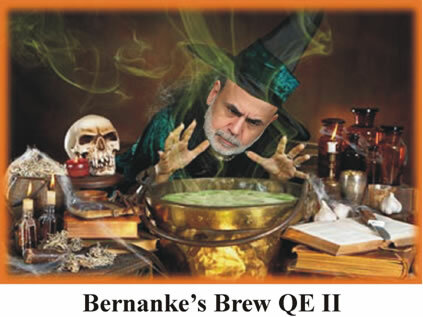 lower interest rates, but this time combined with a new iteration of voodoo economics, a witch’s brew called QE II, a monetary gesture as futile and impotent as a Hail Mary pass thrown by an atheist as time runs out. When central banks became the primary driver of economic prosperity, the free market supply and demand of goods and services became subsumed by the supply of credit from central banks. This is because the supply and demand dynamic is distorted by the availability of banker’s credit—the more credit, the greater the distortion, the greater the distortion, the greater the consequent recession or depression. The free market’s fundamental supply and demand dynamic is distorted by the banker’s credit—the more credit, the greater the distortion, and the greater the distortion, the greater the consequent recession or depression. This is how economic cycles of expansion and contraction became commonplace, boom and bust cycles are but lagging indicators of credit growth; and recessions and depressions are the lagging indicators of credit contractions, the inevitable consequence of economies dependent on central bank credit. The current historic credit boom began in the 1980s when a combination of US government borrowing and easy credit from the Fed ignited what was thought to be the greatest economic expansion in the history of capitalism. But the expansion, however, was only an asset bubble in disguise, a stock market bubble that took the Dow from 777 in 1982 to 11,722 in 2000 before collapsing then reflating to 14,100 and falling and rising again to 11,440. Today, the historic 25 year credit boom is ending and the massive debts accumulated on the way up are starting to default; and the US Fed, the primary source of global credit, is directly responsible for what is now happening. Of course, the Fed denies any responsibility at all, instead blaming others for the crisis it caused. In 2005, then Fed Governor Ben Bernanke identified the problem as a “savings glut”, i.e. Asia being the primary culprit/saver; and in a distorted self-serving way, Bernanke was right. ..over the past decade a combination of diverse forces has created a significant increase in the global supply of saving--a global saving glut--which helps to explain both the increase in the U.S. current account deficit and the relatively low level of long-term real interest rates in the world today. But despite Bernanke’s self-serving observation, Asia has the absolute right to save all it has earned—just as the US has the right to spend all it can possible borrow and spend it on Asian goods; whether or not it is prudent to do so is another question. Today, the Republican Party must be ruing the day it first courted disaffected Dixiecrats, i.e. southern Democrats, then looking for a haven from an increasingly socially liberal Democratic party. This alliance beginning in the 1970s fueled 40 years of Republican dominance but the price for doing so is now being extracted. Sarah Palin is causing William Buckley to roll over in his grave. Traditionally the bastion of Wall Street money and power, the Republican Party’s price to pay for 40 years of political power may be the continued existence of the Federal Reserve. Since the 1970s, the Republican Party gave increasing voice to disaffected Dixiecrats in return for their support and only now are realizing the cost. Note: Traditionally, the sworn enemies of northern power and money, i.e. Yankee bankers, southern Dixiecrats swallowed their pride for an increasing role in Republican affairs, trading their opposition to Wall Street bankers in return for an increasingly conservative social agenda. The collapse of the US economy, however, is putting pressure on this politically motivated alliance. As the Republican Party hierarchy retreats to its traditional base, i.e. banking, corporate and wealthy special interests, much to their chagrin, its indebted and increasingly unemployed socially conservative newly acquired base is blaming not only women, hippies, gays, abortionists and Mexicans for their myriad problems, they’re now blaming the Federal Reserve as well. This resurgent populist movement known as the Tea Party may be the critical driver in ending the economic dominance of the Federal Reserve Bank in America; and, ironically, the Democratic Party, the traditional opponent of corporate and banking interests in America, now finds itself the unexpected ally of the Fed. The Faustian pact between banking and the Democrats was forged in the 1990s when the Democrats, desperate for an answer to the new Republican coalition welcomed Wall Street bankers, Goldman Sachs, into their ranks much as Republicans welcomed the Dixiecrats. The alliance would be a great success for both Wall Street and the Democrats. The loser would be America. No longer having any significant opposition in Washington DC, Wall Street immediately began assembling a banker’s wish list which was approved during Clinton’s two terms with now bipartisan support. Beginning with dismantling any significant oversight of markets, the bankers proceeded to protect the extraordinarily dangerous but lucrative derivatives markets from government regulation and ended the decade by successfully repealing the Glass-Steagall Act. This allowed Wall Street to bet the savings of America as they did prior to the Great Depression, which they again proceeded to lose; and, by 2000, the stage would be set for what would soon follow, the collapse of the American economy in concert with record riches for the bankers on Wall Street. The only hope of America now lies in the electorate’s collective disgust with both the Republican and Democratic parties—and the Federal Reserve itself. On December 9th Bloomberg New reported: A majority of Americans are dissatisfied with the nation’s independent central bank, saying the U.S. Federal Reserve should either be brought under tighter political control or abolished outright, a poll shows. Although the same special interest groups control both the Republican and Democratic parties, the Tea Party’s challenge to the Republican hierarchy is an opening wedge in this collusive tyranny masquerading as electoral democracy. Newly elected Tea Party candidate, Rand Paul, is also the son of tenured Congressman Ron Paul, yesterday’s gadfly and today’s chief gladiator in America’s fight to free itself from the tyranny of the Federal Reserve. Ben Bernanke has had his hands full since his first day on the job as Federal Reserve chairman nearly five years ago. It's about to get even tougher…His harshest critic on Capitol Hill, Rep. Ron Paul of Texas, is about to become one of his overseers. Ron Paul’s appointment to oversee the Federal Reserve is tantamount to King George III appointing George Washington to oversee England’s colonial affairs in 1775. Today, perhaps another great shift in history is about to take place; and, again, as before, nothing less than America’s future is at stake. The end of central banking in the US will come in one of two ways: (1) Through a constitutional amendment that bypasses the US Congress, or (2) through the complete collapse of the monetary system that leaves the Federal Reserve and all central banks bankrupt. The latter is perhaps the most probable as fiat money systems have an average lifespan of 40 years. It was in 1971 that President Nixon removed the gold backing from the US dollar and all currencies became fiat. Do the math: 1971 + 40 = 2011. If the historical mean is any reassurance, the collapse of paper money and central banking is imminent. The following chart shows just how exposed the Fed is to the increasingly precarious state of the US economy. The Federal Reserve is now the largest holder of US debt. Not only are China and Japan vulnerable to a US default, so, too, is the Federal Reserve. It would indeed be justice if the Federal Reserve collapsed because those they indebted were unable to pay them back. A less drastic alternative, however, is a constitutional amendment that bypasses the US Congress. This is necessary because powerful interests would prevent the US House or Senate from ever repealing the Federal Reserve Act. But for this to happen, conservatives and liberals would first have to join forces in order to overcome the powerful elites that will seek to maintain the status quo. Special interests in both parties have a vested interest in the present monetary system and will do everything possible to save the Federal Reserve, no matter how destructive it is to America. If Americans want to end the Fed, they will either have to cooperate in what would be the greatest political undertaking since the American Revolution—or wait for a cataclysmic economic collapse to make that choice for them. While the Federal Reserve central bank substitution of debt for money is a more subtle ponzi-scheme than Bernard Madoff’s, it is nonetheless still a ponzi-scheme. Ponzi-schemes are dependent on the constant influx of more participants, i.e. in the case of Madoff, more investors and, in the case of the Fed, more debtors. When the influx slows, ponzi-schemes become increasingly unstable until they eventually collapse. This is where we are today, in the endgame, where the collapse of the Fed’s 97 year ponzi-scheme is imminent. Today, the vast majority of investors still have their money fully invested in the banker’s paper assets. Like Mr. Klein, they believe they will get their money out in time. Like Mr. Klein, they won’t. While the US makes it difficult for Americans to protect themselves in a time of monetary disarray, there is nonetheless a thriving secondary market in the US for gold and silver coins. Additionally, I will be hosting a call-in show, Dollars & Sense with Darryl Robert Schoon, on local Tucson TV, Saturday, December 18th, at 8 pm MST. I will be answering questions about the economic crisis. The program can be viewed live on the internet at www.accesstucson.org. We are moving towards a financial rendering of epic proportions. Prepare and center yourselves for what will be an historic shift towards a far better world; and, remember, despite how things appear to be, we are all in this together.